Evolution's most compact 210mm compound mitre saw - designed to cut a variety of materials at any desired angle. Couple this with the Evolution Mitre Saw Stand to provide additional support for extra long workpieces, gives you the best value for maximum productivity. Covers all common cutting angles. Accurate cutting with 0˚ - 45˚ bevel tilt and 45˚ - 45˚ mitre angles. Compact, lightweight & robust design, weighing only 5.8kg. Easy to carry with one hand and stare away taking up very little space. 125mm x 55mm max. cross cut capacity. Positive mitre stops both left & right at 0˚, 15, 22.5, 30, and 45˚ covers all common cutting angles accurately and reliably. 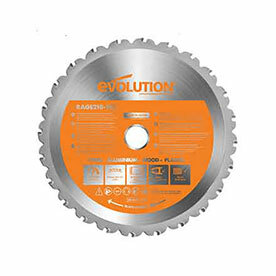 Compatible with the Evolution Mitre Saw Stand (Sold Separately).